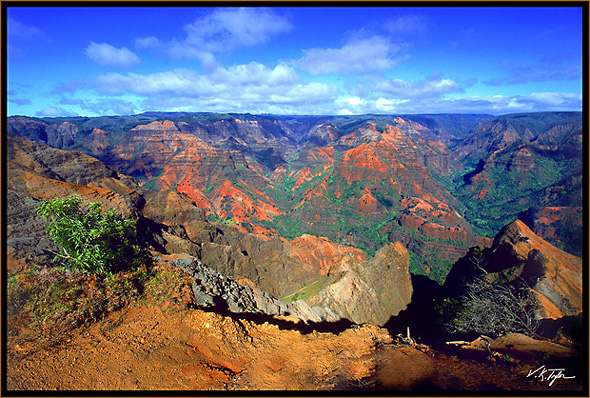 If you have been to Kauai, and have not driven the Waimea Canyon road, I strongly suggest that you do. While smaller, much, much smaller, than its big brother in Arizona, it is nevertheless a real feast for the eyes. It is only fourteen miles long, and two-thirds of a mile deep. Compared to the lush green of the Garden Isle, the rust colored cliffs and rocks stand out even more. It will definitely remind you of the American Southwest. As you drive over from the south or east shore, where most people stay, including us, you will pass several cute little towns. Let me also say that you will pass the Kauai Cookie factory store in Hanapepe. The little beach town of Waimea is classic old Hawaii. From there, the drive goes upward to 4,000 feet above ocean level. Bring a light jacket since it is often cooler here, with periods of showers and misty blankets of fog. Speaking of old Hawaii, Kauai is the island that most resembles old Hawaii. Traditions of aloha seem stronger here than elsewhere. People even drive in a more polite fashion here. But I do not feel safe out on the highways on my rented bicycle. I found a great network of service roads here in the Kauai Lagoons area, and adjacent to the Lihue Airport. I can get an hour ride by making the circuit about 3 times. I guess we are rather spoiled back home with the iron Horse Trail and the Contra Costa Canal Trail. We were able to hit one of our island favorites today at lunch, the famous Hamura Saimin stand in downtown Lihue. Somehow, it survived Iniki. I doubt that the old shack meets even the most liberal ADA standards. In fact, I wonder if it meets even minimum health inspection standards. But their saimin bowls are the best in all of the islands. Add some chicken or beef skewers, and top it all with a slice of their homemade lillikoi (passion fruit) pie. Ichiban! The best time, on almost all of the Hawaiian Islands is after a big rain, with numerous waterfalls and views of the Pacific. You will find respite at the Kokee Museum, while learning about the canyon’s wildlife and origins. Stop at the Lodge at Kokee for their specialty, the Portuguese bean soup, one of my personal island favorites. Just scrape off the fat from the sausage before consuming. Perhaps the most stunning part of the drive is at the end of the road. 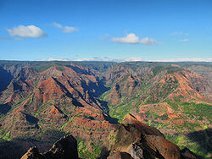 The overlook at the Kalaulau Valley is both majestic, and wondrous. It might be windy, and cold, but well worth the short little walk from the parking lot. You can always stop for more soup on the way back! I have probably done this drive a half-dozen times. Just make sure you slow down on the curves, and stop at every lookout point. Bring your camera, take lots of photos, and tell everyone back home you have seen both of our breathtaking Grand Canyons. ← Hanalei, Looking for Puff the Magic Dragon?